Why PITI is often a PITY. Enter the dollar amount of the price of the property. Enter the dollar amount of the down payment. If you want the PITI mortgage calculator to calculate the down payment for you, be sure you have entered the home price and then expand the description and select a percentage rate from drop down menu. Leave the drop-down selected to "Enter" to enter your own down payment amount. Enter the annual percentage rate (APR) of the home loan. Enter as a percentage without the percent sign (for 6%, enter 6). Enter the term of the home loan in number of years. Enter the dollar amount of the annual property taxes. If you want the PITI mortgage calculator to calculate the annual property taxes for you, be sure you have entered the property price and then expand the description in this row. Then select the most appropriate percentage rate from drop down menu. Otherwise leave the drop-down selected to "Enter" to enter your own. Enter the dollar amount of the annual homeowner insurance. If you want the PITI mortgage calculator to calculate the annual insurance for you, be sure you have entered the property price and then expand the description in this row. Then select the most appropriate percentage rate from drop down menu. Otherwise leave the drop-down selected to "Enter" to enter your own. Optional: If you would like the PITI mortgage calculator to calculate the number of hours you will have to work to pay for all of the various portions of the monthly payment, enter your real hourly wage in this field. Clicking on the link will open the Real Hourly Wage Calculator in a new window. Schedule?Incl schedule?Include amortization schedule?Include amortization schedule? If you would like the results to include an amortization schedule, select either "Monthly" or "Annual" from the drop-down menu. Otherwise select "None". Based on your entries, this is how much of the home purchase you plan to finance (home price minus down payment). Based on your entries, this will be your starting loan to value ratio. This value is used to determine any private mortgage insurance that may be added to your monthly payment. Based on your entries, this is how much interest you will pay on the mortgage between the first payment and the last payment. PI: Principal and Interest portion. PMI: Private Mortgage Insurance. If your down payment is less than 20% of the purchase price, you may be required to purchase PMI on top of PITI payment. Ttl: Total of all PITI portions, plus PMI. This column lists the calculated monthly amount for each PITI type listed in the left-hand column. This column lists the total of all of each PITI type through the end of the mortgage. If you entered your Real Hourly Wage, this column will list how many hours you will need to allocate to working for each PITI payment portion through the end of the mortgage. Hope you like your work! This free online PITI Mortgage Calculator will calculate and total the monthly principal, interest, tax, insurance, and private mortgage insurance (PMI) payments that normally come attached to a home loan. Plus, unlike other online financial mortgage calculators, this calculator will also calculate the number of hours you will need to allocate to working in order to pay for each portion of the monthly mortgage payment between now and when the loan is paid off. If you only want to calculate the mortgage principal and interest (PI) payment, please visit the Monthly House Payment Calculator. Enter the price of the home. Enter the down payment amount. If you would like the calculator to calculate the down payment from a percentage, be sure you have entered the home price, then tap the "+" icon to reveal the down payment percentage calculator. Enter the mortgage's annual interest rate. Enter the number of years you will be financing the home for. Enter the estimated annual real estate taxes. If you would like the calculator to calculate the real estate taxes from a percentage, be sure you have entered the home price, then tap the "+" icon to reveal the real estate taxes percentage calculator. Enter the estimated annual homeowner insurance premium. If you would like the calculator to calculate the annual insurance premium from a percentage, be sure you have entered the home price, then tap the "+" icon to reveal the insurance premium percentage calculator. If you want to discover how many hours you will need to allocate to working in order to make all of the PITI and PMI payments, enter your Real Hourly Wage here. Indicate whether or not you want the calculator to include a monthly or annual amortization schedule, or none at all. Click the "Calculate PITI Mtg Pmt" button. This will display the mortgage amount, the LTV ratio, and the interest cost, plus populate the PITI breakdown chart. This is the breakdown of each periodic payment made to repay the amount borrowed. Each line of the amortization schedule shows the total amount paid for the period, along with the portion that went to pay down the principal and the amount that was used to pay the current period interest charges. The last column is the new balance owed following that period's payment (previous balance minus principal portion of current payment). 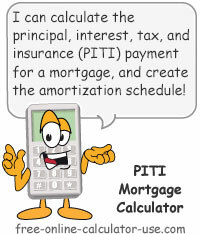 The PITI mortgage calculator allows you to choose whether or not you want the results to include a monthly amortization, an annual amortization, or no amortization schedule at all. What is PITI, and why it's often a PITY. In case you're not familiar with the term, PITI is an acronym that stands for "Principal, Interest, Tax, and Insurance," where Tax refers to property taxes and Insurance refers to homeowner insurance. If you've ever taken out a mortgage to purchase a home, you will know that lending institutions don't trust you to pay your insurance and property taxes on your own. And because they don't trust you, they build those payments into your monthly mortgage payment. I guess I can understand why it's important to the lending institution that you stay current on your insurance and property taxes. After all, if your home burns down and you stop making your mortgage payments the lending institution doesn't want to foreclose on a smoldering pile of charred rubble. Nor do they want to get stuck with a mountain of back-taxes if you default on your mortgage. And speaking of a lack of trust, the lending institutions go one step further (to the delight of private mortgage insurers) by forcing you to pay private mortgage insurance premiums if your loan-to-value ratio is greater than 80% (less than a 20% down payment). I call them "PITY" payments because it's a pity that we didn't choose the Grow Slow, Pay As You Go method of home buying instead of the instant gratification method promoted by real estate and mortgage companies. Because had we done so we could have gotten wealthy just by investing the interest charges we wouldn't have had to pay to the lending institutions. If you've spent any time on this site at all, you've no doubt ran across countless references to the term "Opportunity Cost," and now understand that it refers to the value lost when choosing one alternative action or inaction over all other possible alternatives. Well, because housing represents such a large percentage of our household budgets, it also stands to reason that nowhere will you find greater opportunity costs than in the area of home buying. For example, if you buy a more expensive home versus and a less expensive home, you will suffer the opportunity cost of lost interest earnings that could have been earned with all the savings you would realize with the less expensive home. After all, the smaller and less costly the home, the lower will be the home ownership costs (property taxes, insurance, mortgage interest, utilities, repairs, maintenance, etc.). As I hope you will discover throughout this home mortgage calculators section, the difference between the home ownership costs of a large, expensive, fully-mortgaged home and the ownership costs of a small, inexpensive, paid-for home can literally determine whether you will spend your life living paycheck to paycheck or if you will achieve financial freedom.